My interest in radio stems from shortwave listening in the 1950's on an old tube radio. The audio was wonderful and, with its 150' wire sloper, the old receiver pulled in intriguing signals from the world over. The next two decades were filled with non radio pursuits (education, military, etc.) During that time, however, I never lost interest in radio, with my primary SWL interests being foreign languages. Eventually, I went for my Basic Amateur Radio License in 1977, when I received the VE6AMA call sign. I upgraded to Advanced in 1978, as soon as my mandatory one-year of operation was completed. I never had any aspiration of changing call sign to reflect a higher class license. In those days, CW ranked important in the compulsory skills. Advanced operators had to demonstrate full proficiency at 15 wpm. However, to guard myself against the inevitable test jitters, I made sure I was comfortable at 20 wpm before writing. I operated CW-only for several years, then drifted to SSB to maintain my languages in a realistic conversational context, something I found utterly unnatural in telegraphy. I remained relatively "radio-active" through the decades until my semi-retirement in the Summer of 2004. 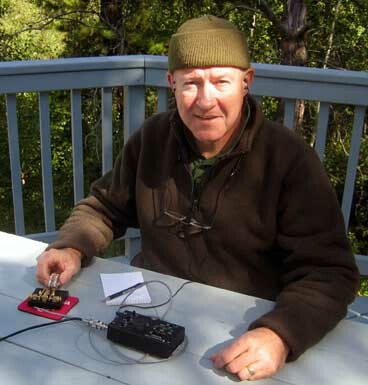 Once a "man of leisure", I intensified my involvement in radio in general, and QRP in particular. My very first transceiver was a HW16, which was eventually replaced by the famed FT-101B and matching accessories. About that time I got into QRP too, with a HW8 that I was eventually glad to see replaced by a FT-7 (which I still own). The FT-101B served me until the early 90's at which time I invested in a couple of newer rigs, a TS-430 (still my current QRO transceiver) and a FT707 (which is now part of my ARES kit). In the late 1990's I became a rather dedicated QRPer. I started with SSB, joined the HFPack group, later became a member of the Adventure Radio Society, and more recently of the NAQCC. Having always been very active in the wilderness, I find that modern radios lend themselves very well to accompanying me due to their amazingly small sizes. Aside from maintaining a simple QRO station -- complete with tri-bander and vertical -- at my rural QTH, I often operate bush-portable with the following rigs: KX-1, FT-817, IC-703, MFJ-9420, HTX100, and 40m OHR Sprint. I generally use Vibroplex iambic paddles (both single and double). Considering the incentive NAQCC offers those using straight keys during some contests, I may soon invest in a Code-Mite (?) My portable antennae range from homebrew wire jobs to commercial screwdrivers and mobile whips. So, where am I now in my amateur radio pursuits? Although I am certainly well set equipment-wise, I see two challenges for the near future. First, I need to devise more efficient antennae for rapid deployments during Sprints and similar events. Right now I have moderately efficient antennae easy to set up, or very good ones requiring considerable time to erect ... ain't life amusing? Second, I need to regain my CW proficiency and go over that 20 wpm hump where I am once again. I do not know for certain if this reflects reality, but when I returned to CW I found that there were fewer operators than before, but these were perceptibly faster than I remembered! In closing, I should also mention that (1) my XYL and son-out-law have their licenses (both HF privileges without code); and (2) as most of you undoubtedly know, Industry Canada has just dropped CW from its list of required skills ... something that does not entirely agree with me. So with that, please accept my most sincere 72/71, and I look forward to meeting you on the air.